Reykjavik bar crawl... Guided Old Town Center tour... ‘Golden Circle Tour’... Gullfoss waterfall... Geysir & Strokkur hot springs... Pingvellir National Park UNESCO World Heritage Site...Blue Lagoon Geothermal Spa... and much more! Have it your way and personalize your trip by adding fun, optional activities. These activities are not included in your land package price to allow free time for those who want to explore on their own. Rates have been specially negotiated with the suppliers and will include transportation to and from the event, if applicable. All options are based on a minimum number of travelers participating. Rates listed are approximate rates in US$ and are subject to change. Contact your tour director upon arrival overseas to book and pay for your options. Payment to tour director in cash in local currency. We drive from Reykjavik through the fertile farmlands of South Iceland, heading towards the majestic mountains towering over the coast, among them the snow shrouded Hekla and the ice capped volcano Eyjafjallajokull, last active in 2010. Continuing we drive through the region where one of the best known of the Icelandic classical sagas, Njal's Saga, is set. The South Shore is one of the most popular regions of Iceland for a number of reasons: The waterfalls Seljalandsfoss and Skogarfoss tumbling over high rock escarpments; the stone arch Dyrholaey with its sheer cliffs, the picturesque setting of Vik village, a row of glaciers towering over the scenery and the Reynisdrangar rock pillars (some say they are petrified trolls) decorating the black beach of Reynihverfi. Late in the day we head back to Reykjavik after a memorable day. Duration: 10 hours. Includes lunch. Get to know Iceland’s most famous natural treasures, experience black beaches, glacier views, stunning coastlines, magnificent bird cliffs, delightful towns, incredible waterfalls, erupting geysers, tectonic plates and take a plunge into the healing mineral waters of the Blue Lagoon. Walk in the footsteps of your favorite Game of Thrones characters and take time to visit the striking wilderness chosen to represent the regions north of the Seven Kingdoms or journey to the dramatic gorge at Thingveillir – the stomping ground of the White Walkers and the Wildlings. Blame it on those long winter nights or perhaps the endless summer days, or the exceptional quality of locally produced beer and schnapps; Reykjavík’s legendary nightlife or "jammith" as the locals refer to it, has gained a reputation for being one of the hottest places to party in the world today! Embark on your overnight journey to Iceland’s capital city. If arriving in the “Land of the Midnight Sun” on a group flight this morning, your expedition starts with a visit to the Blue Lagoon. * Find ultimate relaxation in the healing mineral waters, surrounded by lava fields and snow-capped mountains in this geothermal spa located just outside of Reykjavik. The facilities include modern changing rooms and showers, an indoor geothermal pool, a winter garden and a restaurant. Continue to Reykjavik with a short city sightseeing tour of the northernmost capital in the world. Your tour includes the old town center, the Parliament, Cathedral and much more. Afterwards check into your hotel. This evening, join a welcome orientation and cocktail with the tour director. Later on you are invited to a Reykjavik bar crawl. *Note: Travelers who book airfare with AESU will be met by their tour director in the arrivals hall. If booking your own flights, contact an AESU sales representative for meeting and transfer bus departure time. The Golden Circle Tour is probably Iceland’s most popular day tour as it includes three of the best known attractions. The golden waterfall Gullfoss, is one of the most impressive waterfalls in Europe with thousands of tons of icy water thundering majestically into a deep canyon. The Geyser area has numerous hot springs and geysers, including the famous Strokkur. Thingvellir is the site of the world’s oldest democratic parliament founded in 930 and the beautiful canyon running through the park is the dividing fault line between two of the earth’s tectonic plates. We return to Reykjavik for an evening at your leisure. Don’t miss out on Reykjavik’s legendary night life. Enjoy a free day to explore Reykjavik or opt to join a tour to the south shore. Pass through the fertile farming lands and villages of south Iceland, rich in Viking history and heritage and a view of the infamous Eyjafjallajökull and Hekla volcanoes. Take a walk behind the splendid wall of water of Seljalandsfoss waterfall, then hike on the ancient ice of Sólheimajökull glacier with a professional certified guide. Afterwards take a leisurely stroll along the black sand beach of Reynisfjara with its famous basalt columns and caverns. See the Reynisdrangar cliffs; basalt rock stacks that rise from the sea. Icelandic legends say that they are naughty trolls turned into rock by the rising sun. This great sightseeing tour ends with a stop at the Skógafoss waterfall. Walk up to the thundering waterfall for a bird’s eye view of the tumbling water and rainbows. At tonight’s farewell fish ‘n chips farewell dinner plan your next adventure with new-found friends. Reluctantly we say farewell to Iceland. Jet home with thoughts of your next adventure. 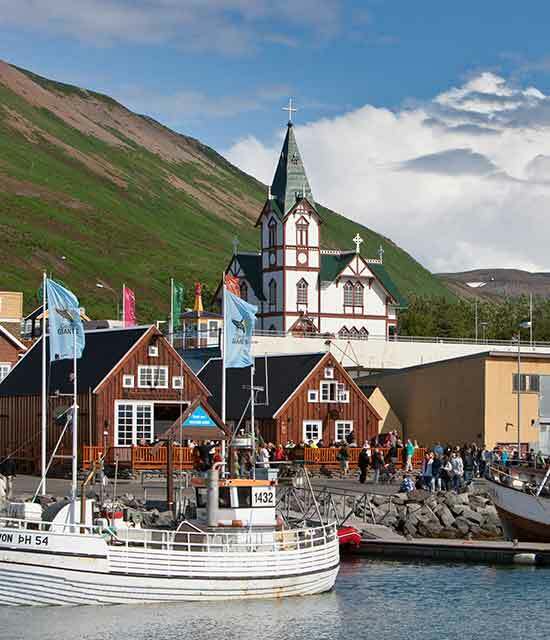 The Laugaveger neighborhood will expose you to the best of Iceland’s shops and boutiques. Wander these streets to find quirky souvenirs and tons of Scandinavian design. The main street also offers unique bars and restaurants to stop in and grab lunch or a pint of Borg beer. The Harpa Concert Hall is a triumph of the modern architectural design Iceland is known for. The exterior façade was made to mimic the dancing colors of the northern lights. Purchase tickets and see a concert or head inside to admire the interior and eat a modern take on traditional Icelandic food at the restaurant. The name of this restaurant translates to ‘The Sea Baron.’ If you’re looking for a delicious way to experience Icelandic cuisine, this is your restaurant. Sægreifinn offers Icelandic fish dishes and it is famous for its fish soups. The no frills approach to good food will leave you with a full stomach and quench your thirst for an authentic culinary experience. This museum offers a window into the lives of Iceland’s original inhabitants. Learn about the hardships faced by the first settlers while you wander through the replicated, traditional Icelandic homes and government buildings. This church is an example of Iceland’s modern architectural style. Its location in the middle of the city makes it easy to visit. The interior is breathtaking and the views from the top of the tower are the best in the city. The Blue Lagoon is located just outside of Reykjavik. Iceland is famous for its hot springs and geysers and the Blue Lagoon allows you to see this extraordinary geothermal activity first-hand. Visit and soak in the natural spring heated pools. The warm water and mineral deposits will leave you and your skin feeling relaxed and refreshed. The National Museum of Iceland hosts information on the most important moments of Iceland’s history. This Museum is a great stop on a rainy afternoon and you will learn about the history of Iceland, from its Viking beginnings to today. 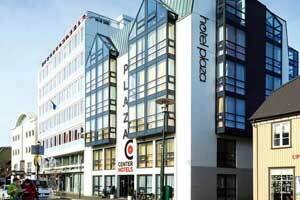 Centrally located on Ingólfstorg Square in Reykjavik’s Old Town, the CenterHotel Plaza offers modern guest rooms with a minibar, satelite TV and free WiFi. The Flybus airport shuttle stops right by the hotel. * Price per person based on a twin share room. If you're traveling alone, AESU will attempt to arrange for you to share a twin at NO EXTRA COST. If you prefer a single room, a single supplement of $595 will apply. Purchase your airfare from AESU and receive free arrival/departure transfers from the airport to your hotel. We also try to book you on the same flights as others traveling on your tour. Land only participants BOOKING OWN FLIGHT OVERSEAS, DO NOT receive airport arrival/departure transfers. If you book land only with us, book your flights from the USA one day earlier than the tour start date. Email Iceland to a friend!